Education Secretary Michael Gove likes to make out he’s a placid, well-mannered, affable kind of a guy. In fact, he’s only able to keep up this pretence because he employs two particularly nasty special advisers – both at taxpayers’ expense – to personally insult and publicly attack anyone on his behalf who might dare to question him or his policies. But now it looks like Gove has finally been forced to bring his two attack dog SPADs – Dominic Cummings and Henry de Zoete – to heel. But just one day after Cummings and de Zoete publicly called ex-children’s minister Tim Loughton a liar – the previously prolific @ToryEducation has been completely quiet. I do hope both of them are now being put to better use on their taxpayer funded wages than slinging childish insults around on Gove’s behalf. 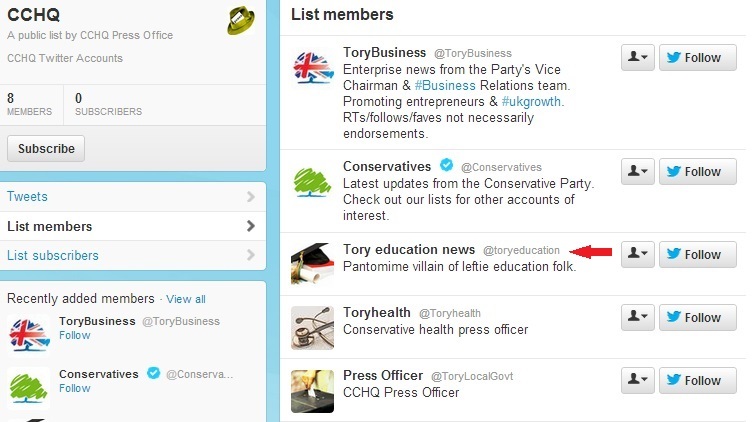 By the way, Conservative Party spokespeople have been furiously denying @ToryEducation is an official party Twitter account and have removed all references to it from their official accounts. So perhaps somebody should quickly point out to them that they’ve forgotten to remove @ToryEducation from the CCHQ list of official Twitter accounts – before someone takes a screen shot of it and proves they’ve been lying. Screen shots are great, aren’t they? So very useful when dealing with the unethical and their taste for creative history. http://liberalconspiracy.org/2013/04/18/the-full-story-of-michael-goves-department-and-the-curious-toryeducation-account/ Longish read detailing the timeline. Worth taking the time. @tom i notice @toryeducation on CCHQ has ‘pantomime villain of leftie education folk’ perhaps these two clown has been fired or as the say about showbiz careers. ” its behind you ”. PUT THEM,GOVE,AND THE REST OF THE IDIOT,INCOMPETENT TORYDEMS,ON A ROCKET,TO PLANET MORON,THEY WILL ALL BE RIGHT AT HOME THERE,WE THE PUBLIC EMPLOY POLITICIANS,TO CREATE THE INFRASTRUCTURE,OF A GOOD ECONOMY,NOW THAT MEANS CREATING ,INDUSTRY,BUSINESS,TO HELP THE UNEMPLOYED,TO FIND WORK,NOW THEN ,AS AN EMPLOYER,IF A PERSON PROVES,UNSUITABLE,,UNABLE TO DO,SAID JOB,THEY ARE DISMISSED,THEY DO NOT HAVE TO WAIT FOUR/FIVE YEARS,TO DISMISS THEM,SO WE NEED A CHANGE IN POLITICS,A TERM OF OFFICE SHOULD BE NO–LONGER THAN TWO YEARS,SO WE THE EMPLOYERS,CAN KICK THEM OUT,VIA GENERAL ELECTIOUN,AND NO MAJOR DECISIONS,WITHOUT,A GENERAL REFERENDUM,AS HAPPENS IN ICELAND,NO WARS WITHOUT A VOTE,—-NO—STEALING–AND—SELLING.—THE–PEOPLES—ASSETS–,ROYAL,MAIL,BRITISH,GAS,WATER,ELECTRIC,RAIL,ETC.WITHOUT,THE CONSENT,OF THE –PEOPLE,,—THE—POLITICIANS–EMPLOYERS,..SO EMAIL YOUR M.P. WRITE TO THEM , PHONE THEM, TELL THEM, STRAIGHT,, WE THE EMPLOYERS,, HAVE HAD ENOUGH,, OF THERE—–CRIMINAL.—-CORRUPTION.